Has the Velocity Racing era officially begun in NHRA Pro Stock Motorcycle? Former two-time AMA/Prostar Street Bike Shootout champion and Velocity owner Barry Henson, who turned to the NHRA Pro Stock ranks over the winter, scored a huge moral victory over Labor Day weekend when he qualified for his first NHRA national event. And Henson didn’t make the field for the first time at just any event, he accomplished the feat at the world’s most famous and prestigious drag race, The NHRA US Nationals from Indianapolis, Ind. Henson finished the fifth and final round of qualifying in the No. 13 spot, with an NHRA career best run of 7.06. Henson’s season-high performance comes after he decided to take a few races off to continue to test and develop his equipment. Henson certainly experimented with his share of components. Over the first half of the year Henson ran power plants built by Rick Ward, Paul Gast and Vance and Hines. Henson, a 20-year-plus motorcycle racing veteran, encountered similar hardship when he made the transition from road racing to street bike drag racing in 2002. However in less than five years Henson was able to garner two national titles and set numerous records, running with class legends like Rickey Gadson and Kent Stotz. 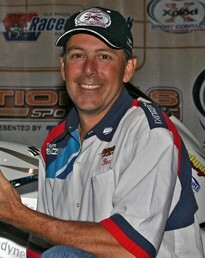 Will the trend of success continue for Henson in Pro Stock the way it did in Shootout?